Google and Motorola are celebrating Black Friday in fashion this week, with a Times Square advertisement that shows off the power of both Google Voice and the Motorola Droid handset. In the US, Black Friday, the Friday after Thanksgiving, is one of the biggest shopping days on the calendar and the official start to the country's Christmas shopping season. In a bid to impress the myriad shoppers in and around Times Square, a giant sign will brandish a phone number for people to phone and shout in their desired instructions. So, courtesy of Google Voice, if you say something like: "show me the money", a Google map will appear with the various banks in the area highlighted. The display is a temporary one and is up there to show off the power of the Motorola Droid, the new Android phone which Google obviously has a vested interest in. 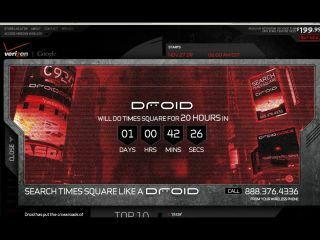 To countdown to the moment Google and Moto take over Times Square, there is a microsite in place which looks like something out of a Terminator movie. With this in mind, if you are in New York and fancy sending some info to the display, please don't mutter the word 'Resistance' or, for that matter, 'I'll be back! ".